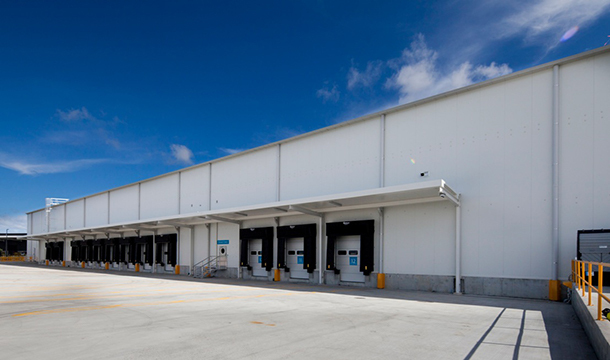 This 11,000sqm Timberley Road facility sits within Auckland Airport’s world-class industrial business park, The Landing. 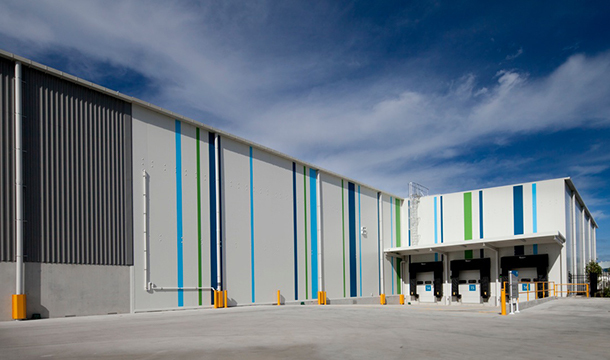 It has enabled Fonterra Brands NZ to consolidate multiple warehouses – four of its own and three third parties’ – into a single, multi-temperature space, optimising storage and reducing freight complexity. 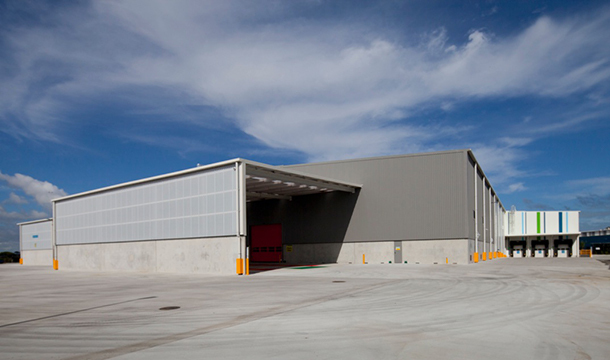 The layout of the facility was heavily influenced by the large (14,000m2) Distribution Centre (DC) building, the shape of the site and goods vehicle movements and site security. The remaining land on the western side of the site allowed the support office to sit where it would have a strong relationship with the street. The 600m2 single story office with its glass frontage set in landscaped gardens creates a human scaled environment in the first view of the site for trucks, staff and visitors. 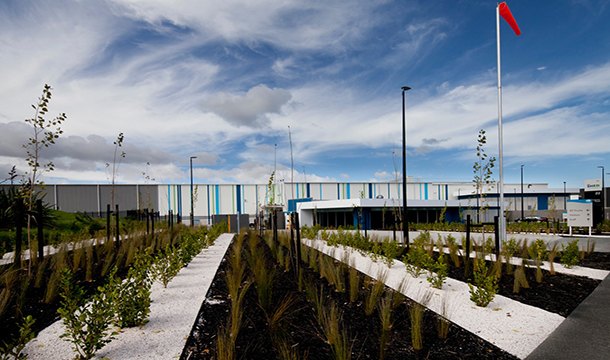 The Distribution Centre includes three temperature zones, as per Fonterra’s storage and distribution requirements: a 3,000m2 ambient warehouse, a 9,000m2 coolstore at 4°C and a 2,000m2 freezer set at a chilly -28°C. Serving them is a 200m2 Plant Room on the Distribution Centre’s south-western corner. This stand-alone building shares material and design element choices with the office, creating a visual connection and softening what could otherwise be a utilitarian look. Controlling the dominance of a large structure over a relatively smaller office building is a common challenge for logistics buildings. On the office, strong colours and design elements have been used to lessen this impact – a slightly over-sized roof height, with a deep edge fascia give strength to the building. 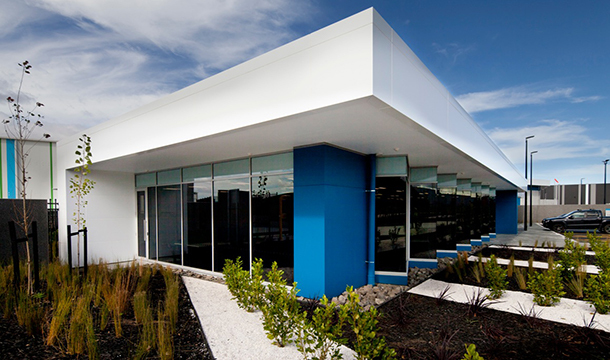 Colours used are bright and from Fonterra’s range of brand colours and further help to bring visual focus to the Office building. Tying the 3 building structures together are colour (stripes of Fonterra brand colours are also used on the DC) and materials, with precast concrete panels forming the walls of the buildings as well as fence panels delineating the public/private security line, all of which in conjunction with the landscape scheme bring cohesion to the overall design. The project procurement strategy utilised early contractor involvement (ECI) where the contractor’s knowledge of buildability and sequencing was captured. As a result, the plantroom and roof access system were modified to allow ease of construction and long term maintenance. This strategy also allowed orders for long lead items and engagement of specialist subcontractors to be secured early, minimising programme and design risks.